It’s been a hot minute since I’ve shared a Natural Products I’m Loving Now Post. I get asked all the time when I’m going to post one, so I’d say this is waaaay overdue! This one is worth the wait, though, friends, because I’m beyond excited to introduce you to Beautycounter. Have you heard of this company? Let me tell you how I found out about them and what Beautycounter is all about. The story starts back in spring when I got a Facebook message from a woman I didn’t know, but said a friend told her about my blog and after reading she thought I’d be interested in this company that is all about natural beauty products. Now, I get these types of messages often. They are either from small companies trying to take off, or acquaintances I once met that want me to join whatever direct sales company they are with, even if they have nothing to do with what I publish on Happy Healthy Mama. It can be overwhelming, so 99.9 percent of the time I answer with, “No, thank you” and move on. This time, however, I decided to try some products since I’m always on the lookout for high-quality, natural products that are safe and effective. I started with the sunscreen since it was close to summer. It’s something I’ve had the worst time finding a good, natural solution to regular sunscreen. Oh. My. Word. 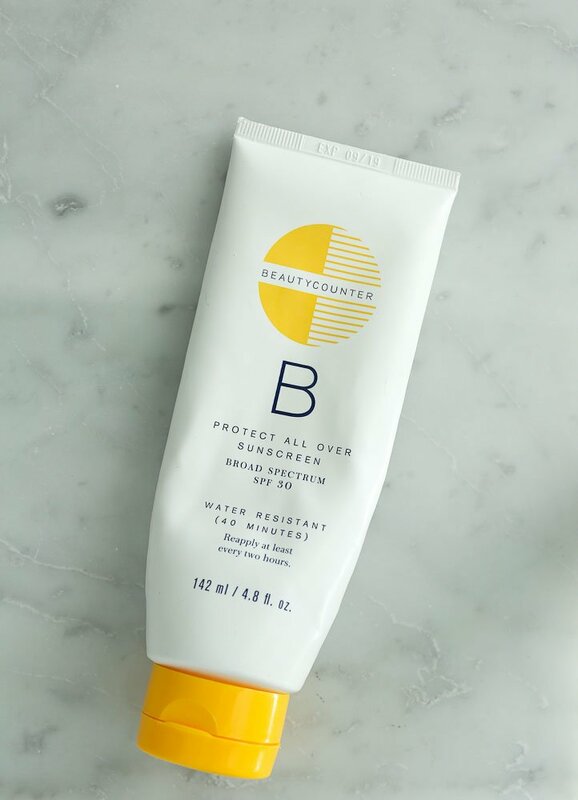 I don’t think I even have the adjectives to describe how great Beautycounter sunscreen is compared to EVERY OTHER natural sunscreen I’ve tried. It goes on smooth and easily, you do NOT look like a ghost, and it has a light, fresh smell. Oh, and it works! I will never use another natural sunscreen. This one is IT. My kids have actually forbidden me from ever going back to any other natural sunscreen we’ve tried. I knew if I loved the rest of their products with even a fraction of the amount of love I had for the sunscreen, I’d be happy. The rest is history. Every product I’ve tried since I have loved, but more about that in a minute. Let me tell you why Beautycounter is so special. The whole mission of Beautycounter is to get safer products into the hands of everyone. Most people aren’t even aware of the dangers that are hidden inside the products they put on their bodies. So many known carcinogen and hormone-disrupting chemicals are there in products with synthetic ingredients, being absorbed by their skin, and they don’t even realize it. The rest of us are left searching for quality, natural products, having to research everything we buy to ensure we are buying safe. 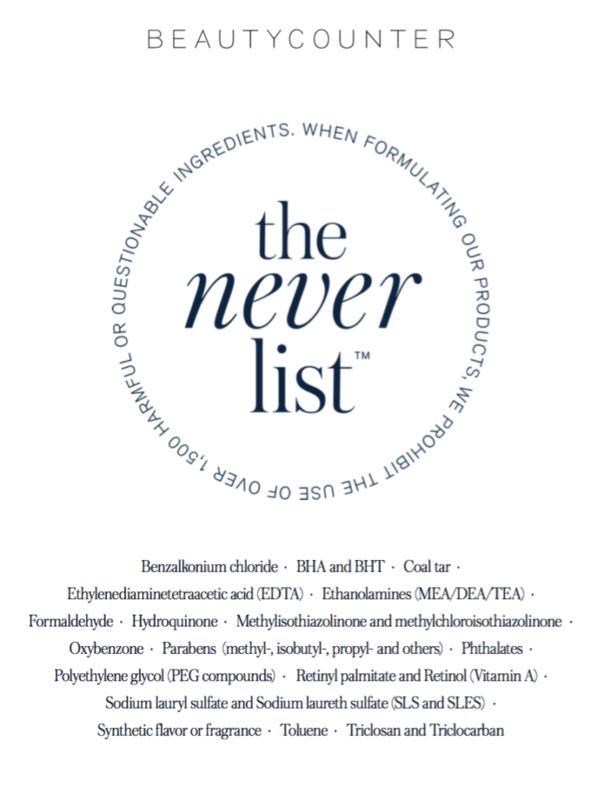 Beautycounter helps take some of that work off of our hands by letting us know there are over 1,500 ingredients on their list of ingredients they will NEVER use in ANY of their products. All of their products rank low (in the 1-3 range) on the EWG’s SkinDeep database. (Remember, low is good!) It’s a breath of fresh air to have a company like this and I’m truly in love with their products and their mission. Now I’m excited to tell you about more of their products I’ve used and can recommend to you! The set includes a Touch Up Concealer Pen, Tint Skin Hydrating Foundation, Lengthening or Volumizing Mascara (I have Volumizing), Powder Blush Duo, and a Lip Gloss. It’s perfect for everyday makeup! The foundation doesn’t feel heavy at all and has a medium coverage. You can layer it for fuller coverage. The mascara performs very well-I’ve been surprisingly impressed with it! It stays on all day. 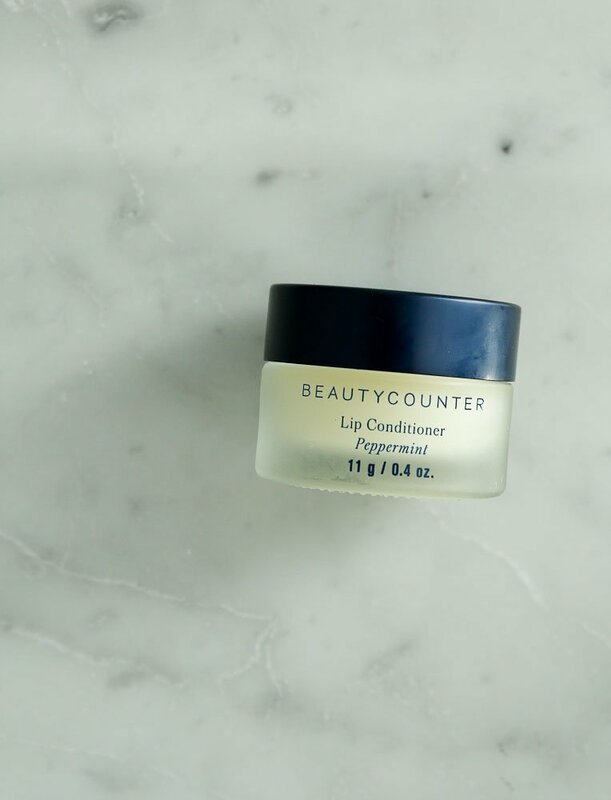 I was hesitant to try Beatycounter makeup since I was pretty happy with what I was using. I’m SO happy I made the switch though as Beautycounter is safer and performs! WINNING. I have also used two different shades of their eye shadow duos and have been super happy with them. They have a whole lot of more products I need to try, but Flawless in Five has me convinced I will like whatever else I try. I ordered this Mattifying Powder in addition to the Flawless in Five because sometimes I get a shiny face. I’ve never used this type of powder, but I have been so happy with it. Instead of adding another layer of color/makeup feel like regular pressed powders do, it just absorbs any shine on your face. (I’m not wearing it in the picture above, but I probably should be…) I highly recommend this! 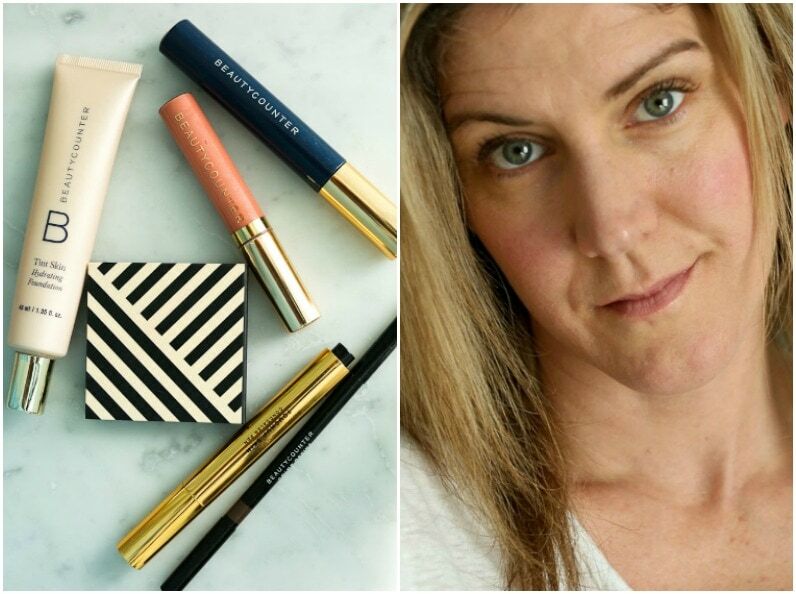 Ladies, if you aren’t using natural makeup, I urge you to try Beautycounter makeup. You’re putting it on your face everyday! You deserve safe, natural products. I have searched for YEARS for a shampoo and conditioner I can recommend. I’ve finally found them! 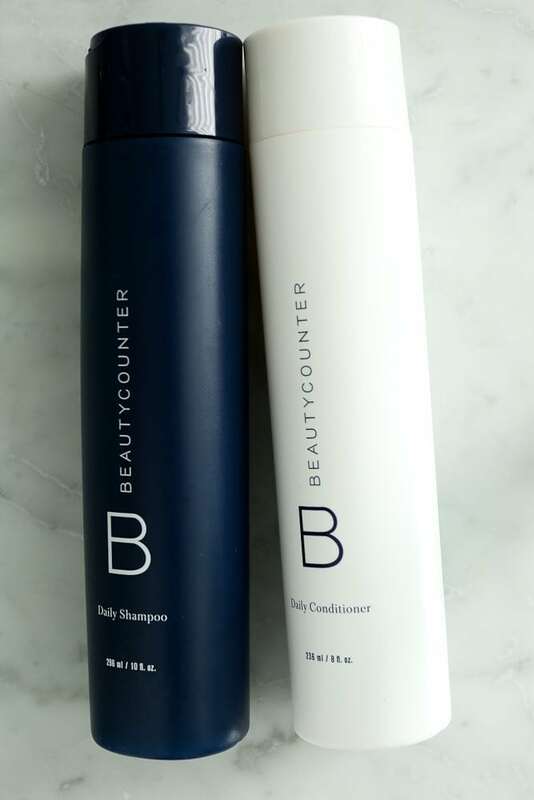 Beautycounter has a whole line of hair care products, but the basic Daily Shampoo and Daily Conditioner have been great for me. Yes, I color my hair, and it’s protected the color just fine. (I knowwwww coloring my hair isn’t natural….but grey is not my color! Sorry…) I do also use this deep conditioner which is great for keeping my dry hair in better condition. BC doesn’t have a deep conditioner yet! Oh, how I love this stuff. This lip conditioner keeps my lips soft, smooth, and hydrated. It’s made with peppermint, which makes it “taste” great, but also works as a natural lip plumper! Bonus! 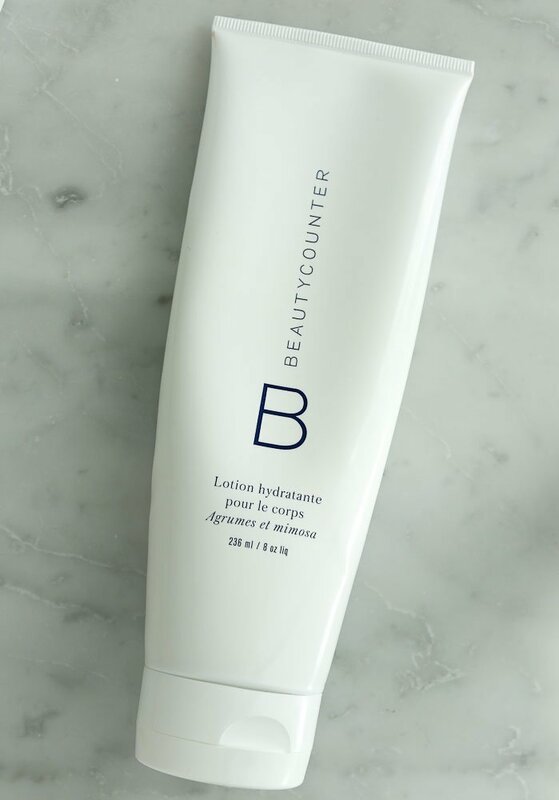 You all know I’m a lotion girl, and I’ve really loved this Beatycounter Hydrating Body Lotion. This Savannah Bee Company Royal Body Butter I told you about a few years ago is still very much a favorite, but it’s quite thick and rich. 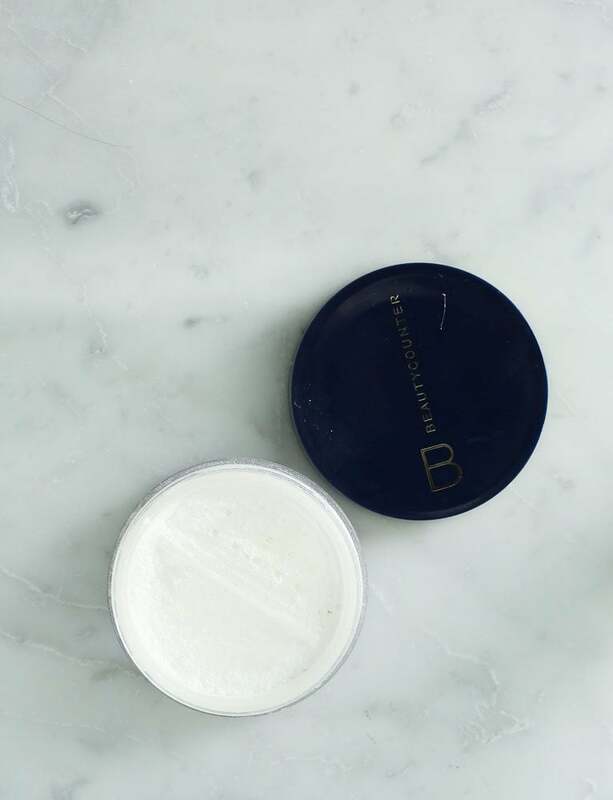 I like having a lighter lotion on hand, also, and this Beautycounter lotion is just that. It has a very light citrus scent, but it’s almost like unscented. I don’t use any of Beautycounter’s facial cleansers or moisturizers because I am still 100% in love with my Klo Organic Beauty oil cleansing regimen. If it ain’t broke, don’t fix it, right? I did add a little extra anti-aging action into my routine. The No 2 spa set also comes with an oil, but didn’t need another oil so I’ve only used the mask and facial mist. Both are formulated to tighten skin and help reduce wrinkles. Yep, I need all the extra help I can get over here! I’ve been using the mask two times a week and the mist everyday before applying my makeup. Love them both! 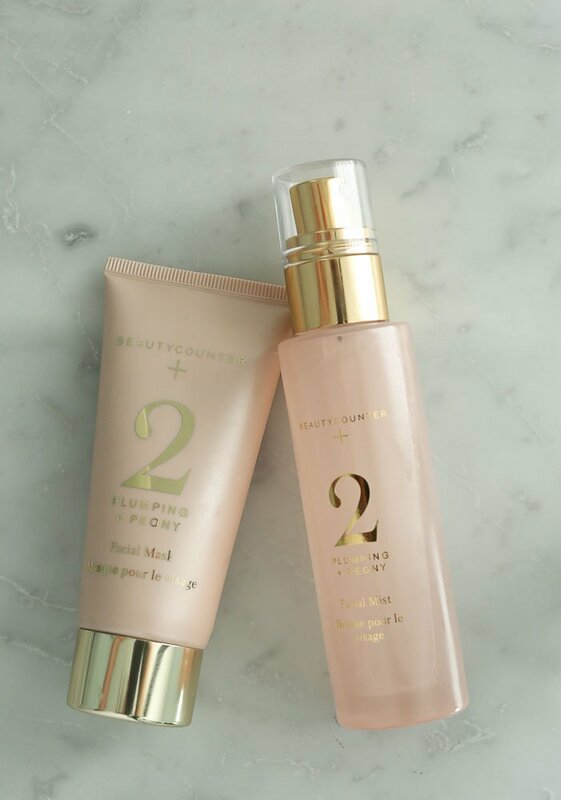 Are you as excited about Beautycounter as I am?! You guys, this is an amazing company that I am so grateful I stumbled upon. If you are interested in trying their products, you can order through any of the links on this page (my consultant links) and I would greatly appreciate it. I am so happy to answer any questions you have as well! I will keep you updated as I try more products. So excited to get this product recommendation. I have been trying to find a good all natural sun screen and beauty products! I already placed an order. I’m so glad to hear that Julie! Please keep me updated on how you like them! Love these products too! The Flawless in Five makes it so easy too!! 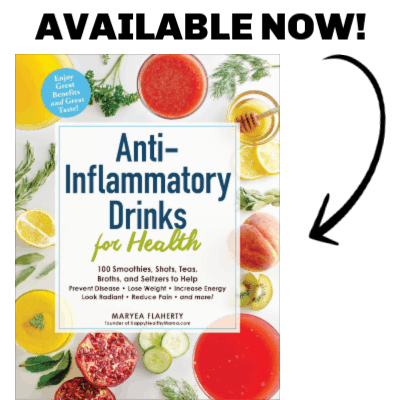 I have been interested in these products, especially since I am quickly inching my way toward….the age that won’t be mentioned.